Where required, UNHCR and WASH actors should work together to develop a country level refugee WASH strategy document that clearly describes the refugee context and the baseline WASH situation, along with short, medium and long-term strategies for each of the WASH sub-sectors. 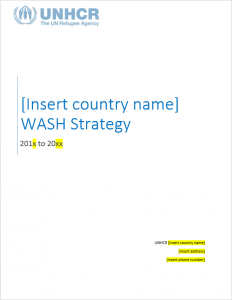 This template can be used to help produce a short and concise Country level WASH Strategy. It includes a phased approach, HR requirements and site-level Operational Plans.